My friend, Wendy, visited all 72 quilt shops in the 2016 Quilt Minnesota Shop Hop, over 2 weeks time! That was in July/August, 2016. She was one of 99 participants that made it to every participating quilt shop. 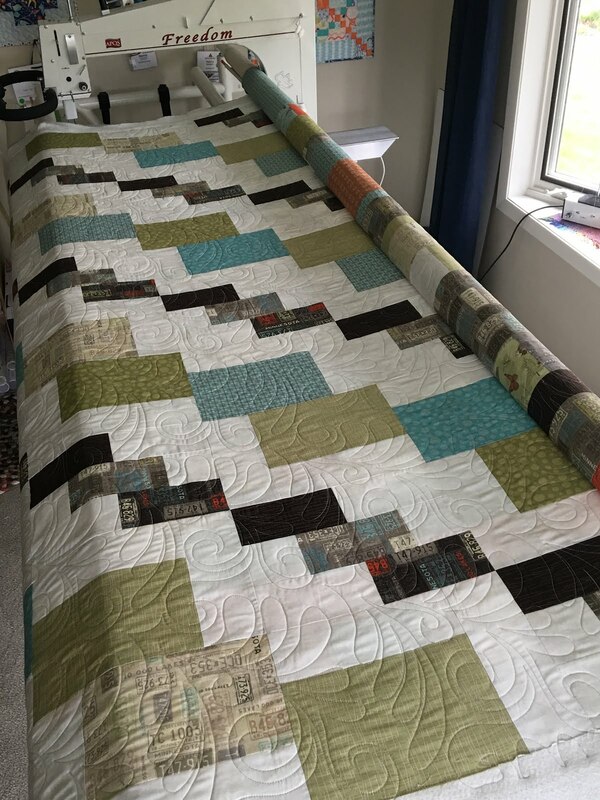 She made this quilt top from the 2016 Minnesota Shop Hop fabrics. The pattern is Marching Band by Terry Atkinson. For quilting, she requested an edge-to-edge design called "Americana Flourish". The back is a pieced quilt in itself! Every shop gave out a free 5" square of the shop hop fabric, so the backing includes 72-5" squares, as well as some of the other fabrics she didn't put on the front. A bigger photo of the back. And here's the front, photo taken on a rather windy day! Great job, Wendy! It finishes 72" X 91". Great memory of your 3050 mile trip! 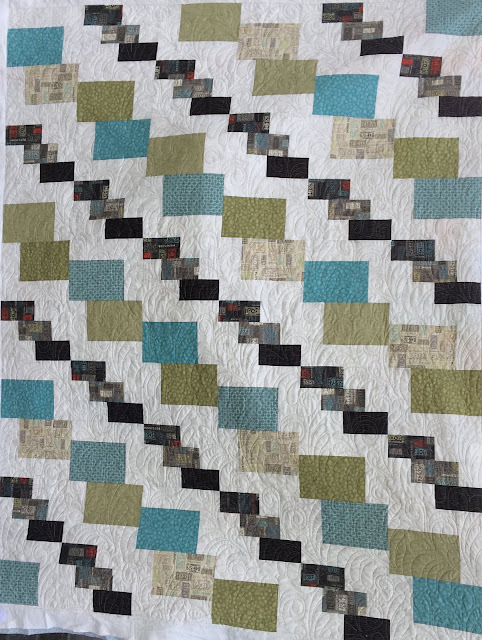 You'll find my 2016 Minnesota Shop Hop quilt here. Check out interesting quilt links at Cooking Up Quilts, Love Laugh Quilt, Sew Fresh Quilts, Quilt Fabrication, Small Quilts & Doll Quilts, Crazy Mom Quilts. 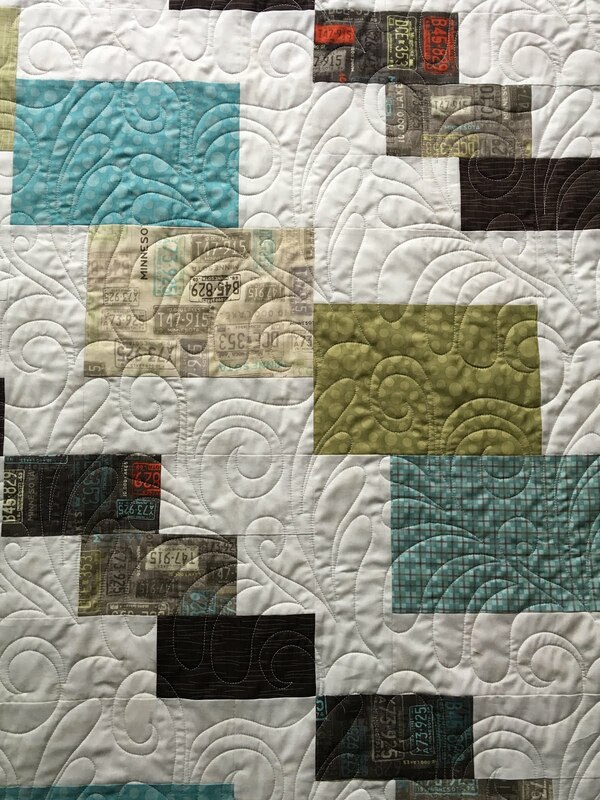 That quilting design is very pretty and looks perfect on the quilt. What a great memory quilt! Wow, that's alot of miles! 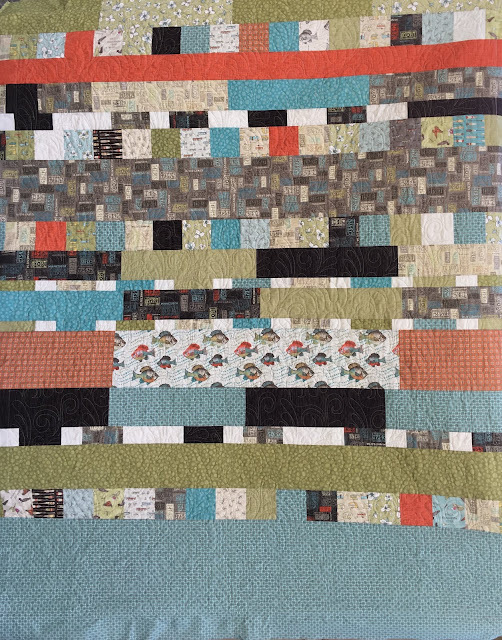 What a great way to remember it, with a quilt of the fabrics she picked up. Your quilting really looks good. I like the pattern! Wow, that is a huge amount of miles and time, wonderful quilt. ok, I am putting that on my Bucket List. What a great story quilt and lovely quilting. Wow I can't imagine visiting that many shops in the short amount of time, but kudos to her!! Nice job on the quilting. That is awesome! What a trooper to hit all of the shops -! 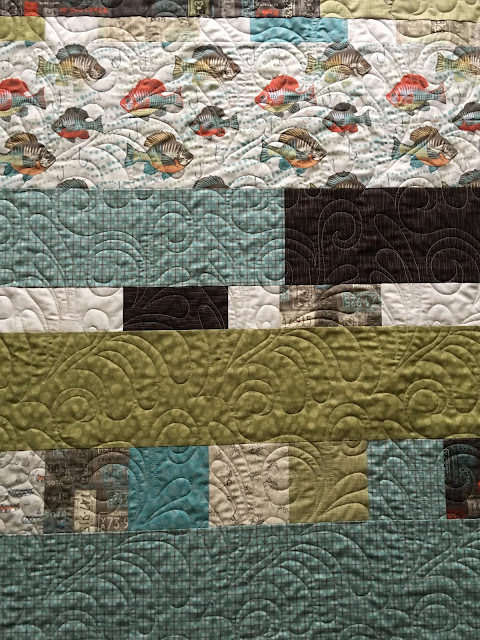 What better quilting motif than this one for such a fun trip. Who knew that it would take two weeks to get through a shop hop? Whew!